Ibiza, Biodiversity and Culture, was designated because of its marine ecosystems, Phoenician ruins and a fortified acropolis. The marine ecosystem along the shoreline of the islands is notable for its well-preserved Posidonia, a kind of seagrass. 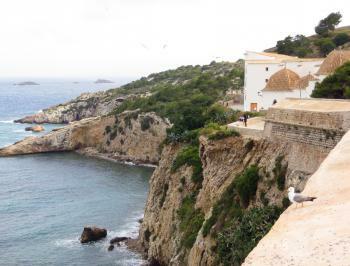 Ibiza’s 16th century fortifications have influenced harbour towns in the Caribbean. Ibiza was known as Ebysos during Phoenician times. It was an important harbour in the Mediterranean. Remains from that period include the cemetery of Puig des Molins and the Archaeological Site of Sa Caleta. Ibiza, Biodiversity and Culture is one of the most eclectic WHS on the list. It includes seagrass beds, salt lakes, Phoenician ruins and 16th century military fortifications. As far as I am aware, there is no common link between these features besides their geographical proximity. Previous visitors rated this WHS a meagre 2.08 out of 5 stars on average, so my expectations were not high when I flew out to Ibiza for a weekend in late February. But at least I would enjoy 2 days in the sun while it was freezing severely at home. Saturday I spent on Formentera, Ibiza’s small sister island that lies half an hour away by ferry. It is much more unspoilt, and features 32 ‘green routes’ of hiking and bike paths. The northern tip of Formentera is also part of the core zone of this WHS. It is known for two things: the salt flats, where flamingos and other birds nestle in winter. And for the ecosystem of the Posidonia seagrass – possibly the most unknown part of the site’s OUV. By following the trails #1, #19 and #2 from the harbour of Formentera, I created a nice 14km hike through Parque natural de Ses Salines. I was looking out mostly for the seagrass, and was expecting to see long, flat strips of green leaves underwater near the shoreline. I had no luck until I entered the beach of Ses Illetes (‘the best beach in Europe’, and a nudist beach too!). It is renowned for its very blue water and soft sand – both effects of the seagrass prairies that act as natural barriers. While walking on that beach I saw tons of brown strips that could be nothing else than dead seagrass. Next to it were hundreds of hairy balls, similar to kiwifruits: these are balls of fibrous material from the Posidonia seagrass foliage. A really odd sight. On Sunday I started out at the Puig des Molins museum. It is located in a residential area in the center of Ibiza-City. Entry is free on Sundays, and this is a site well worth visiting. The museum has 5 display rooms full of Punic, Phoenician and Roman findings from the cemetery that was present at this location. The remains of the dead were buried together with numerous objects, of which the painted ostrich eggs stand out most. Lots of Egyptian-style figurines were also found. The only downside of the museum is that all texts accompanying the objects are in Catalan and Spanish only. Afterwards one can also have a look into one of the hypogea (or rather: a network of connected hypogea), which lies in a field next door. 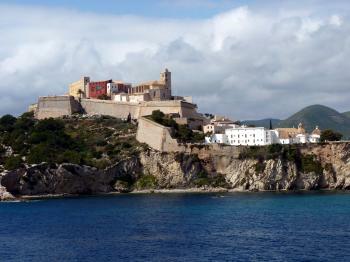 Finally I made my way uphill to Dalt Vila, the fortified upper city towering above modern Ibiza-City or Eivissa. On a Sunday it is totally devoid of any action. There are some viewpoints from where you can have a look at the fortifications or the harbour, but that’s about it. I was pretty disappointed by it all. In the end, my first hunch that allocating one day for the whole Ibiza WHS was already enough turned out to be true. I spent Sunday afternoon reading and enjoying the sun in the harbour. I had no idea what else to do. The excursion to Formentera and the pleasant hiking over there will remain as my best memory of this weekend trip. Q - “So, where are you off to this time?”. A- (somewhat diffidently!) “Oh, just to Ibiza!”. Response - “Not your normal sort of destination?” And that was true - for over 50 years we had passed over the Balearics as not being “worth” bothering with! But now they contained 2 of our last 3 unvisited Spanish WHS so the time had come to grit our teeth and join the “hordes”. But our timing in late March 2016 meant that we were well out of season and the resort areas beyond Ibiza centre were ghost towns. However, this also meant that museums and buses were still on the winter timetable, whilst our selection from among the all-night discos was to be severely limited! We decided to get to Ibiza by taking the ferry from Palma after a few days in Mallorca - a 4 hour trip which gave us a fine view of the old town from the sea as we entered Ibiza port (photo) As other reviews have commented, the inscribed site has 4 elements and we took in 3 of them, leaving out the Punic site of Sa Caleta as no buses ran there on Sunday and a view of a few low walls seen through a boundary fence didn’t seem worth getting a taxi or rent-a-car for. We did pay a visit to the northernmost part of the Salines area. That is situated just south of the airport (the salt lakes can be seen from the departure lounge!) but, as a strict nature reserve, access was very limited – though we did get nice views of Flamingo – not a common sight in Europe! Which takes us to the old town of Dalt Vila. There are plenty of walking routes around the walls and streets and you could take a couple of hours or a day as you wish. It was certainly an attractive area to walk around out of season, but the “List” does already contain a lot of fortified walls – those on show here illustrate design concepts from 16th to 18th C. The entire site is well signed in 4 languages (Cat/Cast/Eng/Ger) and (when they are open!) there are free exhibitions in some of the Bastions. As far as I could discover, the Archaeological Museum in the Cathedral Square is still closed for refurbishment with no known date of opening. One “new” museum nearby is the “Madina Yabisa Interpretation Centre” which concentrates on Ibiza’s “Islamic period”. An aspect I noted during our tour around Spain last year was that Spain seems to be re-examining and almost trying to “come to terms with” its Islamic past. I commented on this to the curator at Madina Yabisa and she suggested that Spain had indeed always previously repressed this aspect of its history and was now trying to bring it into the open. On this matter I notice that some Web sites still talk of the “Arab occupation” of the Balearics whilst others use the less confrontational phrase “Islamic period”!! At one of the exhibitions I had a chance to discuss “matters WHS” with a curator. I was particularly interested in a sign I had seen in front of some marshland between the new port and the lower town – it was titled “Ses Feixes Des Prat de Vila. Sol rustic protegit d’especial interes” and was adorned with large UNESCO and Patrimonio Mundial logos. What was it and how could this be?? Was there an element of the site of which I was unaware? I was told that this area was currently within the buffer zone, that it was hoped to get it fully inscribed one day but that the land owners were against this - though there was no explanation as to why it already sported the logo. On my return I investigated on the Web and indeed it does appear that there are plans along these lines (though it is not yet registered on Spain’s T List ). In 1999 Spain made a revised Nomination which attempted to meet the requirements of this offer! The addition of Sa Caleta and Puig des Molins extended the scope of the cultural nomination back to Punic/Phoencian/Roman times and the inclusion of Las Salinas and the maritime area between Ibiza and Formentera with its natural values including its “Posidonia Prairies” added a natural aspect to justify Crit ii /iv. But, further to this, Spain also made reference in its nomination to the cultural values of the Salt works in the Las Salinas area forming a “Cultural Landscape”, a further Punic site below Dalt Vila (Le Soto) AND the “Ses Feixes Arab gardens”. Thus the Nomination File contains a significant section describing Ses Feixes (E.g. pages 91-5) in which it is described as “Enclave singulier des potagers Arabs”. It appears that ICOMOS even visited the area since its evaluation report states “The organization of the fields of Ses Feixes is unique in the Mediterranean and reveals an Arab-Berber origin. The Nabataeans used a similar capillary system in the Negev desert”. In fact ICOMOS and IUCN recommended “Referral” and “Deferral” respectively for the cultural and Natural aspects. What exactly happened next at the WHC is not clear - the ICOMOS evaluation includes a final paragraph indicating that, just a few weeks before the meeting, Spain had produced a revised justification and an “oral recommendation” would have to be made at the WHC! Whatever- Spain somehow emerged “all smiles” with a successful inscription AND with all those cultural elements which so concerned ICOMOS STILL located in the “Buffer Zone”! Since then it appears that both UNESCO and some conservationists have been pushing for Ses Feixes (and other areas nearby) to be added to the inscribed site, citing both cultural and natural preservation reasons. Officially the Ayuntamiento of Ibiza is progressing this matter but has also overseen (in the face of some opposition which used Ibiza’s WHS status in their arguments) the construction of a large new port facility (where we had arrived on our ferry) on the far side of Ses Feixes. As a result, the Ses Feixes area sits forlorn and forgotten but ripe for development between port and town. If you are interested in learning more then a Google search on “Ses Feixes UNESCO” will return a number of relevant documents. a. In both Balearic nominations (see my review of Mallorca’s Tramuntana), Spain somehow managed to get the WHC to overturn the AB’s recommendations for de/referral in order to gain inscription. b. Similarly, within both inscriptions there was a blurring of the lines between the nominated “core area” and the buffer zone with “value” being claimed within the latter - presumably to make the overall site seem “better” than the content of the “core” warranted! c. The UNESCO Web site doesn’t identify separate locations for this inscription and doesn’t even provide a map. Also (currently) this web site describes it as having “1 location”. In fact it has at least 3 and probably 4. The 2015 SOC report (1040 pages!!) includes maps as well as better/more up to date descriptions of the site. Dalt Vila, Puig des Molins and Ses Salines d’Eivissa I Formentera are clearly separate “locations” with no shared boundaries. Sa Caleta abuts the Salines but is purely Cultural, whilst the Salines are purely natural – therefore it seems better to regard it as a separate location – so, 4 in all. d. I really can’t see any logic in mixing the Natural site of Les Salines etc in the same inscription as the totally separate Cultural sites of Dalt Vila etc to create a single “mixed” site. It seems to result entirely from Spain’s attempt to “big up” a number of “weak” elements to create a “better” overall case! 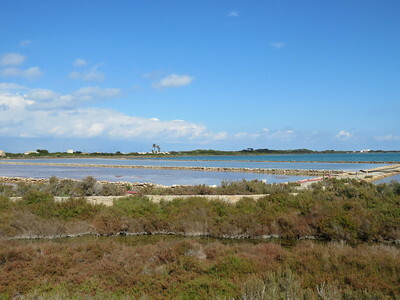 At the time of the nomination, Spain tried to claim a “Cultural Landscape” aspect for the Salines and a joint natural/cultural aspect for Ses Feixes but then left them in the buffer zone! As far as I am aware Ibiza is the only one of 32 “mixed” sites which has completely separate geographical areas for the site’s Natural and Cultural values. The only thing they “share” is that they are on the same island!! There are some who go to Ibiza for the parties, and there are some who go for the World Heritage Site; count me in the latter group. When I was looking for an easy day trip from Barcelona in spring 2013, I settled on Ibiza since it was only a short flight away. Over 2600 years ago Ibiza was settled by the Phoenicians, who named their new port after the Egyptian god Bes (fittingly the god of music and dance). The Phoenician settlements and the fortified Dalt Vila, or Upper Town, in Ibiza Town form the cultural backbone of this mixed heritage inscription. On my visit, I spent a good couple of hours walking around the Upper Town ramparts and learning about the city's Arab, Catalan, and Spanish heritage. Unfortunately the cathedral was closed, but the views of the town, harbor, and rocky coastline from the fortress walls were impressive. Ibiza's natural component of its mixed heritage inscription is for coastal marine life supported by underwater seagrass. While I didn't get to see this component up close, I was very impressed with Ibiza's natural beauty, particularly on the rocky north shore near the Port of Saint Miquel, which, although not part of the inscribed area, was extremely photogenic. Logistics: Ibiza is accessible by boat or plane, and I found it relatively easy to travel around the island via the local bus system. Surprisingly for many people, the holiday and party island of Ibiza has a wide range of historic and natural attractions that were somewhat randomly put together in one WH site. 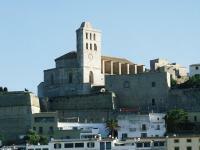 The major sight is Alta Vila, the historic centre of Ibiza Town. It sits on a high hill similar to the Acropolis and offers great views over the sea and the island. It is surrounded by a well-preserved city wall, and features several historic buildings, including the cathedral. 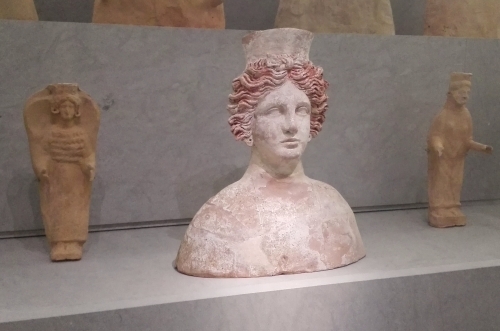 Unfortunately, the archaeological museum next to it has been closed for budget reasons since January 2010. A short walk away, the Punic site of Puig des Molins has been closed for similar reasons since October 2010, although you can see quite a bit through the fences. The small archaeological site of Sa Caleta, on the coast near the airport, is also included, but there is really not much to see (only a small enclosed area with a few walls and stones). The natural component is the Ses Salines Nature Reserve, which covers the southern part of Ibiza, the northern part of Formentera, and the small rocks and seas between them. Taking the ferry between the islands gives you a good overview, and I also visited the Ses Salines beach on the southern tip of Ibiza, which includes walkways through pine forests and paths along the salines. I'm not sure if I saw any of the famous Posidonia sea grass, although it is entirely possible (hard to tell from normal algae). I arrived on Ibiza by ferry from Valencia, and spent 2 days on the island. I found this to be sufficient for sightseeing purposes, but of course, Ibiza has plenty of other attractions. Eivissa town is very compact which made reaching the castle and cathedral atop D'Alt Vila easy despite the steep hill upon which it is situated. The necropolises and one remaining windmill of the Puig des Molins are similarly situated. I took bus #11 out past the airport to visit the salt lakes of Ses Salines as well as the nearby sandy but shadeless beach. Afterwards I took a #26 bus around the coast to Sa Caleta where I walked out to the cliff edge to visit the excavated Phoenecian village. Well... Ibiza is my favourite place in the world, but mainly dueto its beautiful mediteranean beaches and top-notch nighlife. Sure it has some history too, but can you compare it to, say, a temple in Cambodja in terms of WHL-inclusion? Hypogea: The underground tombs in the Puig des Molins necropolis are described as "Hypogea"
Punic Empire: Puig des Molins and Sa Caleta are both described in the AB ev as "Phoenician-Punic"
Extended from original TWHS: Originally only D'alt Vila. An extended nomination followed a rejection in 1987.